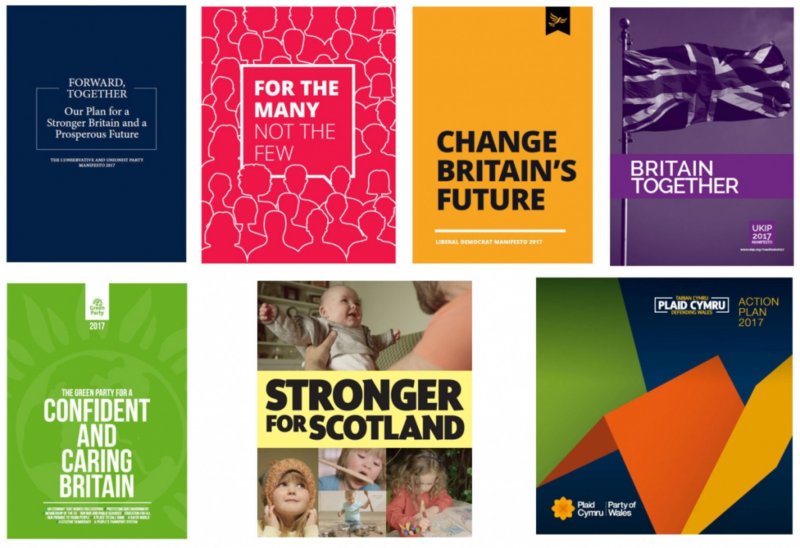 The Brexit General Election manifestos: Is this it? The manifestos of the Conservatives, Labour and UKIP set out radically different visions for Brexit Britain. But – a year on from the referendum – almost nothing in them of any significance is contingent on Brexit. Whether it is re-nationalisation or new arrangements for social care, pensions, tax rises or cuts, industrial strategy, “global Britain”, education or equalities – all these big issues could be on the agenda in identical terms for Britain in the EU. The Conservatives do identify a short list of smaller changes that can take place only once we have left, though so vaguely expressed that one cannot tell what would be different: there will have to be trade deals to replace those we have left; an energy policy focused on outcomes not means; controls on the export of live animals for slaughter; unspecified changes to agricultural support; withdrawal from the London Fisheries Convention (a pre‑EEC agreement allowing European vessels to fish in certain UK waters); a less bureaucratic replacement for structural funds. UKIP also have a list, from removing VAT on women’s sanitary products, via allowing more river dredging to a “buy British” campaign. But these are minor issues in the manifesto. Only on human rights are the Conservatives clear of what they see as the opportunity of withdrawal: they will immediately drop the EU’s Charter of Fundamental Rights; and review the Human Rights Act once the Brexit process is complete. But beyond that there is no vision for what the parties would do differently once no longer bound by our EU membership. All the high minded talk of national sovereignty is revealed as empty nostalgia – unless we are to make this huge and costly change and only afterwards think what the point of it was. Brexit is therefore revealed as being only about a mean-spirited hostility to immigration. Even Labour “will develop and implement fair immigration rules.” – with no clue what these might be. Only UKIP give real policy detail. Leaving aside the two years when net migration was above 100,000, average net migration in the 1990s was 40,000 a year. So we should regard that as the target. Even ignoring migration of EU citizens, Theresa May has comprehensively missed that target in every year. ONS Reports tell us that the average total of net emigration of UK citizens and net immigration of non-EU citizens in the years 2010 to 2016 was about 125,000. Though we should expect irritating new rules to try to bear down on numbers, there is no reason to believe that she will be more successful this time round – unless the climate of hostility and slowing economy mean that EU citizens leave in large numbers. So even the one big change that the parties are promising for Brexit Britain looks unlikely to be delivered. Even now, a year on, with all the planning that has gone on since the referendum, no-one is able to point to a big substantive programme of changes that would justify the costs and upheavals of change. There is no content to mantras about “taking back control” or “freeing Britain from Brussels”. Oddly, the public do not mind. Brexit is like a religion – or totalitarian political movement: it is sustained by faith alone. Believe in this creed, and you will be saved. But there will have to be a change for Brexit. And if it is not substantive, it will be in the form of nasty anti-immigrant anti-EU rhetoric and a narrowing of horizons. And then at some point, Leave voters will realise that they have been cheated. A combination of non-delivery and nationalist rhetoric will lead to resentment and anger. And whom will that be directed against? Probably not the politicians and newspapers who promised miracles if only the faithful believed in Leave. My guess is that the Brexit press will blame the foreigners: immigrants and the EU. The manifestos show no upside to Brexit. But we can foresee a ratcheting up of the anti-immigrant rhetoric to conceal the emptiness of the Leave promises. It is all the more important that the electorate should have the chance to make a final decision on Brexit in a referendum once the negotiations with the EU are complete. Michael Romberg is a member of the Committee of London4Europe. You can read more from Michael on his Facebook page: Campaign for the Real Referendum – on the Terms of Brexit.